1 pm: Meet at Turkey Run State Park at the Inn parking lot, ready to hike. 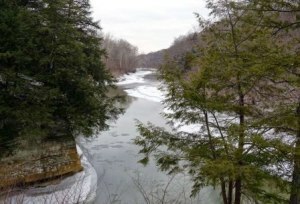 1:30 - 3:30: Enjoy 2.5 miles of gentle hiking along ice-fringed Sugar Creek. Trek under grand sycamore and walnut trees, under a towering icefall, through a snow-dappled beech forest, past "gypsy gulch," and across a 130-year-old covered bridge. 4:00 pm: Check into your comfy room. 5:30 - 6:30 pm: Savor dinner at the inns dining room, with its great salad bar and buffet of yummy, down-home cooking. After dinner: Soothe your muscles with a relaxing swim, or join us for table games and to sit around a roaring fire in the inns great room. 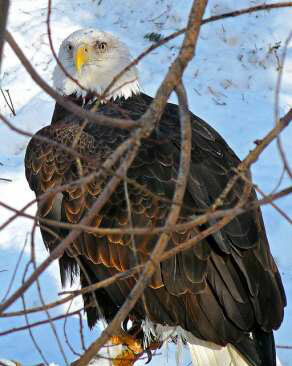 6:40 - 7:30 am: Celebrate the new day with an optional trip to Sugar Creeks winter eagle roost, where dozens of eagles take wing for a day of hunting and fishing. 7:45 - 8:30 am: Enjoy a yummy inn breakfast. 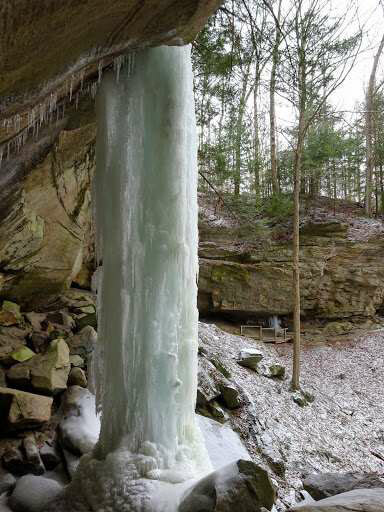 9 - 11 am: Hike through towering sandstone canyons, along natures ice sculptures, and along rocky overlooks above Sugar Creek. 11:30 - 12:30 am: Lunch at the inn. 1 - 3:30 pm: Tour authentic wooden covered bridges of Parke County, which are recorded in the National Register of Historic Places. Each bridge has a story, and our local guide will share them -- along with other area info -- as we explore in our coach bus. 3:30 - 4:30 pm: Free time. 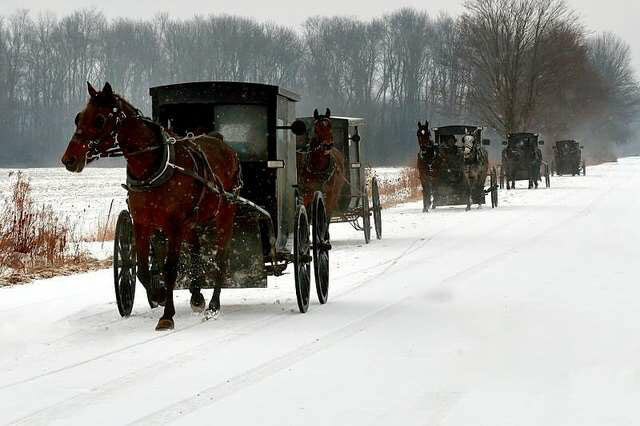 5 - 8 pm: Walk back in time as were welcomed into an Amish familys home. The family will serve us a delicious home-cooked meal and answer questions about their lifestyle and beliefs. Dinner includes: Baked and fried chicken, mashed potatoes, mixed vegetables, tossed salad, bread and jam, and four different (!) pies. Enjoy this view of Sugar Creek on our last days hike. 7 - 9 am: Breakfast on your own at the inn. 9 - 10:30 am: Enjoy our last hike as it winds through stands of evergreens, above and over frozen creeks, and through gorgeous canyons. Free time or head home. Check-out time is noon. cozy inn, built in 1919. Our room block is in the historic lodge (rather than the cabins). Rooms have full baths, coffee-makers, TV, hair dryers, alarm clocks, lotion/shampoo, and WiFi. Relax in the heated indoor pool from 10 am to 11 pm. While rooms do not have microwaves or refrigerators, you may rent a mini-frig for your stay.